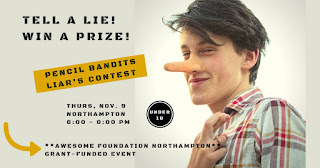 WHAT: The Pencil Bandits LIAR'S CONTEST. Sponsored by Awesome Foundation - Northampton, MA. Henry Reade and his friends are hosting a "Liar's Contest." It's also a book launch party for the second Pencil Bandits comedy adventure, "The Castelli Curse." 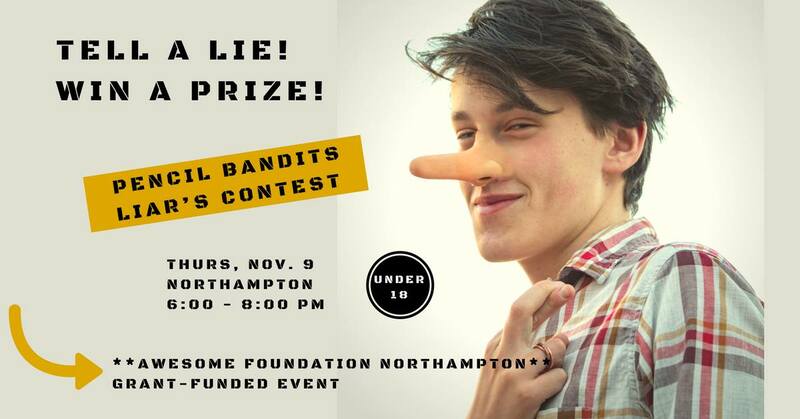 The Liars Contest will include amusements for young people, including performances from the book, pizza, beverages and pencils. Judges will include filmmaker Melissa McClung and Johnny Memphis, the WRSI radio personality and bandleader. Here's how it works: pairs or teams come up with a quick story that's true for only one of them, based on the prompt we give, like maybe "the time I got hurt." Then each team-member tells the same story, and the audience and judges decide who's lying. Winners get $50 cash, an iTunes gift card, candy, Pencil Bandits books and swag, and maybe an ugly, one-of-a-kind trophy. This is to celebrate the release of "The Castelli Curse," Book Two of the Pencil Bandits series. If you came to the Bad Rap Contest, you know this will be fun. It's all hosted by M.C. Larry, described by Henry Reade as "the worst MC in this hemisphere." Be there or be miserable!